Thumb space on iPad screen. Using my iPad I have found that whilst holding the device in my lap I tended to rest my right thumb on the screen. This of course immediately opened the application that my thumb rested upon. I immediately decided to create a clear space for my thumb and use the bottom right of the screen to for scrolling and “thumb space”. Icon screen with thumb gap at bottom right. To move the bottom right icon to the next screen, choose any icon and click but do not release. The icons will now appear to “dance” and will have circled X’s in the corners, then with the bottom right icon, slide it with your finger to the right. The next screen of icons will appear and you can place it where you desire. 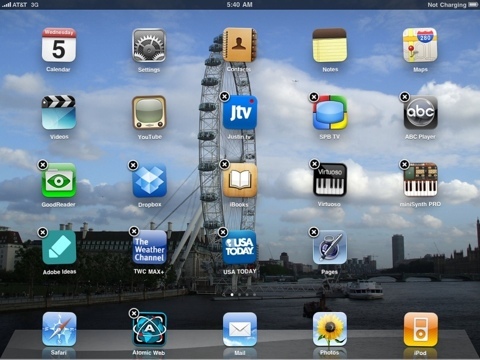 Click the button (the only real button) on the front of your iPad to stop the icon “dance”. Incidentally, if you want to delete an application, click the circled X’s during the icon “dance”.